This smaller capacity model is ideal for people with smaller gardens or a few fruit trees. 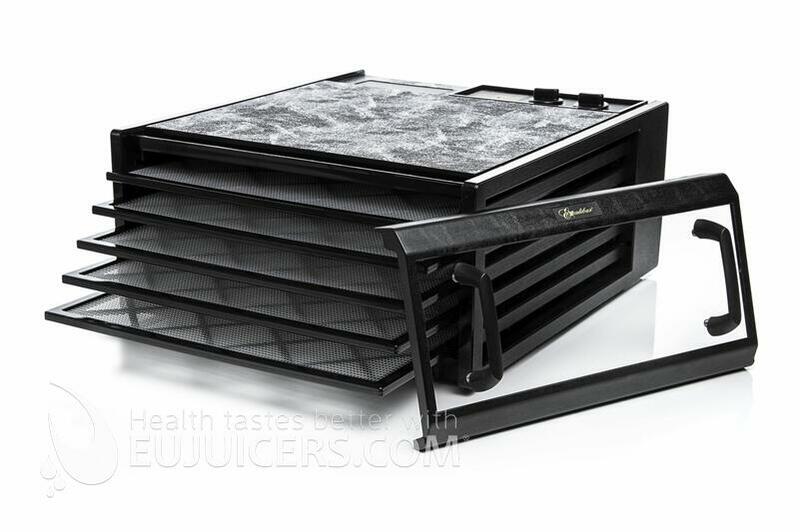 The Excalibur 4526TBCD dehydrator contains 5 large drying trays with a total area of 0.74 square meters. 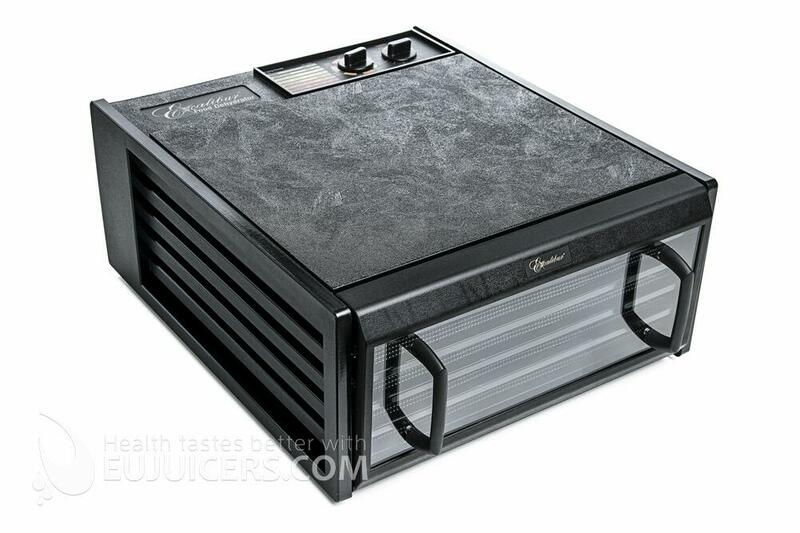 This dehydrator is equipped with a 13-cm fan, 400 Watt motor, adjustable thermostat, and clear door for easy monitoring of produce. The case, doors and tray frame are made of very durable and strong polycarbonate. All components are manufactured and assembled in the United States unlike some faulty Chinese copies sold under various brands. The Excalibur 4526TBCD dehydrator comes with an adjustable thermostat and an easy-to-use 26-hour analog dial timer. This lets you set it and forget it. You needn't worry about when to turn it off, or over-drying herbs or produce. Removable trays let you customize drying space for small or large items which is impossible with stacking dehydrators. Bulky items get dry up to 10 times faster than in round dehydrators. When drying liquids of mixed fruits and vegetables or yogurts, you can cover the drying trays with Paraflexx non-stick sheets. Dried fruits, vegetables or meat jerky are just the beginning! 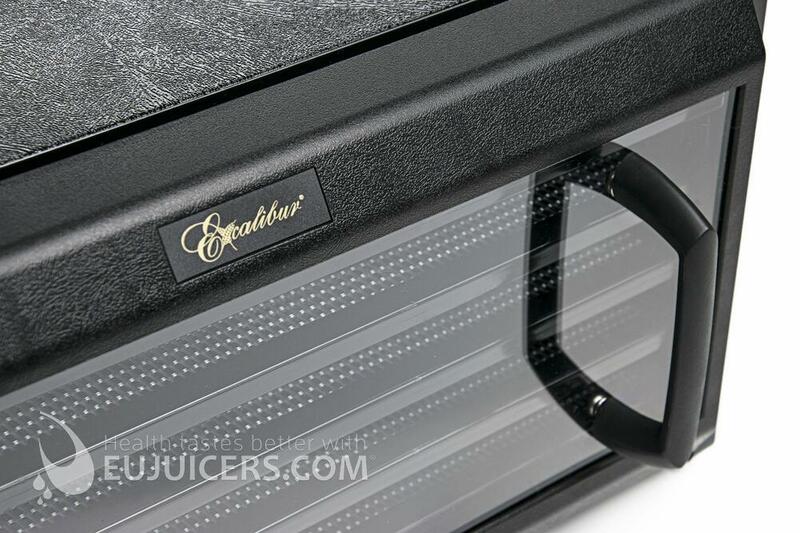 The Excalibur dehydrator is truly a multi-purpose device. Fruit, vegetables, flowers, bread, yogurt and many other things are possible. Most Excalibur models except for the RES10 and EXC10EL are based on the same "box" format, with vertical sliding trays and a rear-mounted fan blowing air from back to front. The differences lie in the number of trays (5 or 9), the color/materials (black, white, stainless steel, and with or without a timer. Performance among all the "box" models are similar, with uniformly excellent results. The 4526TBCD is a 5-tray model in black with a simple analog dial timer. 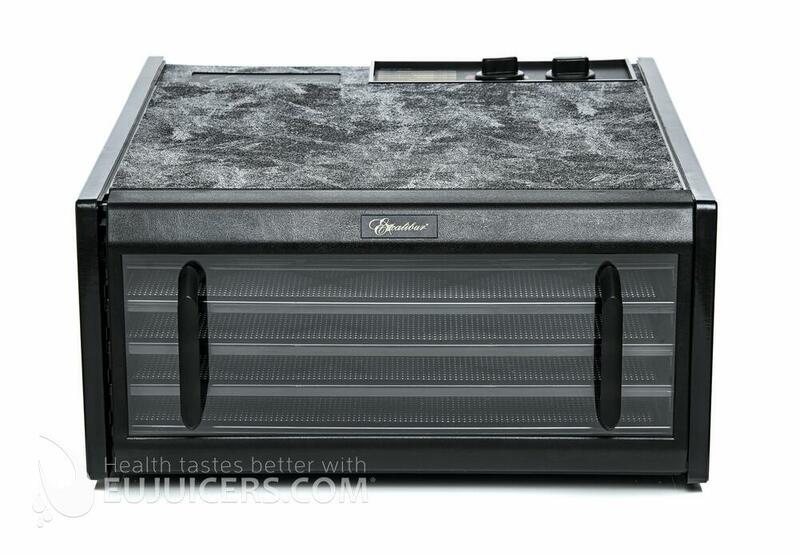 It also features a clear door to allow you to keep track of your dehydrating without opening the door.